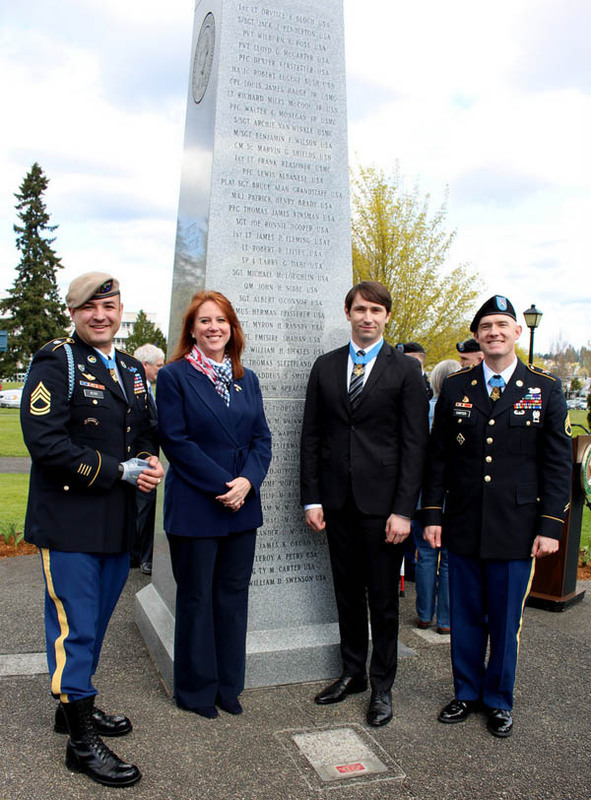 Washington paid tribute Wednesday to three of the state’s bravest sons, military heroes who are the latest to receive the Medal of Honor, the highest commendation for gallantry and bravery on the battlefield. Secretary Wyman joined Gov. Jay Inslee and other officials; MG Terry Ferrell, commanding general of the 7th Infantry Division, JBLM; veterans’ organizations; family members, and previous recipients in honoring SFC Leroy Petry, Capt. William Swenson and SSG Ty Carter. Seven of the 76 living recipients of the Medal live in Washington state, the governor noted in declaring Medal of Honor Day on Wednesday. After ceremonies in the Capitol Rotunda, the newest recipients’ names were added to the Medal of Honor Monument on the Capitol grounds, just east of the Winged Victory Monument.